OVERLAND PARK, Kansas - Champion Traps & Targets, makers of interactive and challenging target systems and trusted eye and ear protection, will launch a brand new electronic hearing muff at booth #14551 at the 2018 Shooting Hunting and Outdoor Trade (SHOT) Show in Las Vegas, January 22 to 25. 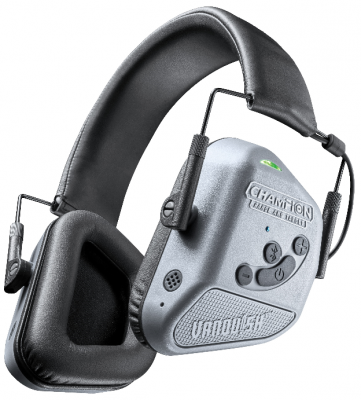 The new Champion Vanquish Electronic Hearing Protection was designed from the ground up for the shooting sports. Each muff was acoustically modeled on gunshot reports to achieve the optimal balance of all day comfort and noise reduction. Available in six SKUs Vanquish muffs all feature Safe Level Sound Compression Technology with an ultra-fast refresh time <1ms. Two full dynamic range HD speakers ensure sounds are crystal clear. Omnidirectional microphones pick up everything around you, giving a natural sound while minimizing wind noises. Four Vanquish models are Bluetooth-enabled and have the ability to take and receive phone calls. The Elite models (40982 and 40983) take technology to the next level by incorporating rechargeable lithium-ion batteries (12-hour runtime) and active noise cancellation making sure unwanted ambient noises are eliminated. Champion Vanquish Hearing Protection offers 3, 5 or 6x amplification and standard models start at $69.95. Bluetooth models start at $124.95, with Elite Bluetooth at $249.95.